We have a wide range of displays for a variety of uses. No. 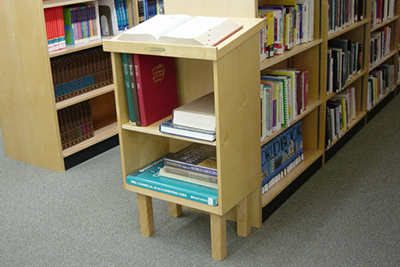 LTN-40 - LECTURN - A sturdy but movable unit with sloping top, one adjustable shelf. 24" wide. 17" deep. 43 1/2" high at back, 40" high at front. No. DS-34 - DICTIONARY STAND - Inter­mediate shelf is adjustable. 41" high at back, 43 1/2'' high at front, 24" wide, 16" deep. Sloping 1 1/2" thick top. Shelf size: 21 3/8" wide, 14 1/2" deep. No. AC-75-6 - ATLAS CASE - 1 1/2" slant top. 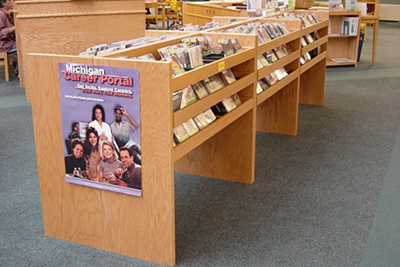 6 slide-out shelves. Back panel finished so unit can be set any place. 43" high at back, 39" at front. 30" wide, 27" deep. 12 1/4" legs. No. AC-75-5 - ATLAS CASE - (Not shown), 5 slide-out shelves, same size but 4" lower. NOTE: All units come standard with legs 2 1/2" square style. Tapered style available upon request. No. 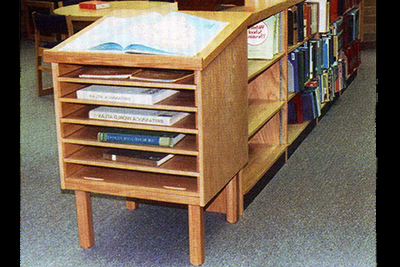 BDT-65-BOOK DISPLAY TABLE-for the best display, this table holds about 50 to 60 books. Apron table is 30" high, 42" wide, 32" deep. Bulletin board is 21" high. No. RC-69 - RECORD RACK - Holds 50 records per opening. 39" high, 19 1/2" deep, 56" long. Top compartments 8 1/4" deep at back, 6 3/4" at front, 13" wide. Lower storage area 13" x 14 1/2'' high. No. RC-70 - RECORD RACK - (Not Shown), like No. RC-69 but solid closed base with swivel casters, 39" H x 19 1/2" D x 56" L.
No. 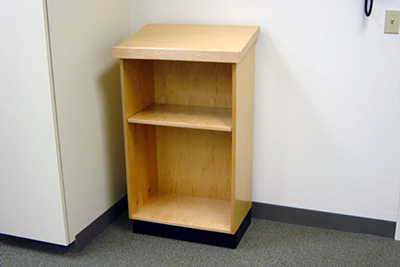 RC-71 - RECORD RACK - Open base storage. also holds 50 records per opening. Size: 40" H x I 9 1/2'' D x 56" L.
No. MR-33 - MAGAZINE RACK - has 6 compartments, displays more than 25 publi­cations. Finished all sides, easily moved. 41 1/2" high at back, 36 7/8" wide, 16" deep. Legs 12" high. No. 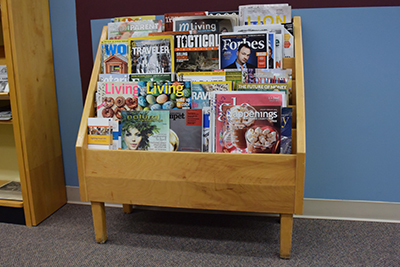 MR-60 - MAGAZINE RACK - (Not shown), same style but with 8 compartments. Holds more than 40 publications. 60" high at back, 48" wide, 23" deep. No. 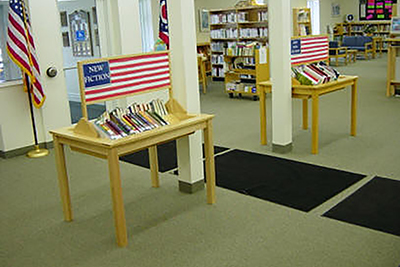 NPR-10 NEWSPAPER RACK-handy to display current newspapers, easy to move where needed (10 sticks included). 38" long, 27" deep, 29" high. No. RDS-2 - REVOLVING DICTIONARY STAND - Can be set on desk or table. easily moved. Swivels 360° for quick reference. 21" wide. 14 3/4" deep. .2" high at front. 6" at back.